Persimmon grove in Southern California. Photo copyright Carl Kravats 2012. Perhaps one of the reasons persimmons are still so foreign to Americans is because of an unpleasant persimmon experience, likely with a native American persimmon or a Hachiya (Asian persimmon). If you were dared by your Uncle Eddie into tasting an unripe astringent persimmon as a child, I’m sure you were horrified by its unpleasant tannic flavor. Your tongue felt like sandpaper and the inside of your mouth felt like a dried up beach towel, and it stayed that way for a few minutes! But had you tasted a ripe Fuyu persimmon it may have become one of your favorite fruits. 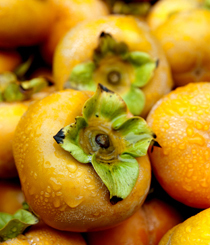 There are two types of persimmons: astringent and non-astringent. Fuyus are non-astringent allowing them to be eaten when they still have a crunch to them. Native American persimmons and Hachiya persimmons are of the astringent variety. Sadly, everyone’s first taste wasn’t a Fuyu. The poor little orange Fuyu persimmon is sadly misunderstood in this country, and many people have no idea how to eat them or use them in cooking. In many other cultures outside of North American, persimmons are a valued and prized fruit. The one quandary I have about persimmons is describing the flavor of a ripe Fuyu persimmon to someone who has never tasted the fruit, because a persimmon tastes like a persimmon and nothing else! It’s not a fruit that can be hastily described as one so often hears certain meats described as “tasting like chicken.” It has a unique sweetness that is very delicate and luscious. It seems Thomas Hariot, a scientist in the second Roanoke expedition to the New World in 1585 agreed. He described the persimmon, "as red as cherries and very sweet: but whereas the cherrie is sharpe and sweet, they are lushious sweet." He clearly tasted a very ripe Native American persimmon. Persimmons. Photo copyright Carl Kravats 2012. 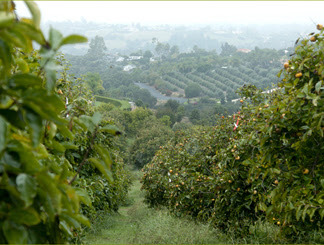 An excellent source of organic persimmons is Beck Grove AKA LaVigne Organics in Fallbrook, CA. You can reach them at 760-723-9997 or at their website but you better hurry because there aren't many left! It's funny how you write about tasting an unripe Hachiya. I got suckered into it by a friend. I'm going to try a Fuyu. Hey! How about some recipes? Okay, will do. I'll post a recipe later today.